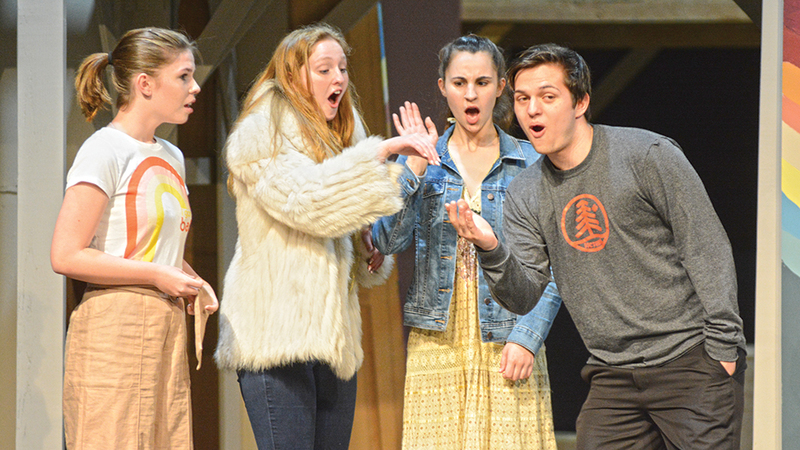 McNary theatre students spent the last weekend of April bell-bottom shopping. The drama department has set its final show of the 2017-18 season, Shakespeare’s Much Ado About Nothing, in the 1970s after the Vietnam war. The show features a disco scene, choreographed by Zoe-Lisa Banton, of City Dance Theatre. During the masquerade ball, one character attends as Princess Leia. The play opens on Thursday, May 17 at 7 p.m., followed by an after school performance at 3 p.m. and evening show at 7 on May 18. A matinee is scheduled for 2 p.m. on May 19 with a final show at 7 p.m.
Tickets are $5 for students and seniors and $7 for adults. Cavanaugh had planned to do Twelfth Night as McNary’s annual Shakespeare play but decided to change course after more than 40 students auditioned. Cavanaugh ended up with 30 students in his cast of Much Ado About Nothing. In the show, Hero, played by Ivy Parker, and her groom to be, Claudio, played by Noah Schnell, team up to play matchmaker to two people who absolutely despise each other, Beatrice, played by Sydnie Gould, and Benedick, played by Jacob Fritts. Parker Kehret plays Beatrice’s father—Leonato. Since only six boys are in the show, Cavanaugh had to do as much cross-gendering as possible. Abrianna Feinauer had turned Don Pedro into Donna Pedro. Dogberry and Verges are also females.